Crude oil is continuing its rise after picking up a dollar yesterday. The EIA’s across-the-board draw helped bring prices to the black, causing the petroleum complex to move higher. This morning, crude oil is trading at $69.95, a gain of 44 cents. Fuel prices also notched some gains yesterday, with diesel rising by over 3 cents while gasoline rose by a bit less than 3 cents. Today, prices remain in the black. Diesel prices are currently $2.2517, picking up a penny since yesterday’s close. Gasoline gains are outpacing other products, rising 1.4 cents to trade at $2.1195. With oil trading just shy of $70/bbl, it’s worth remembering the pattern oil prices have been going through lately – slow and steady gains followed by big, quick losses. We noted last Friday that $72 will be a key band of price resistance for oil – if prices can break through that level and up past $74/bbl, technical analysis suggests prices could continue the bullish streak they’ve been on for two years, and $80 would be a conceivable next target. If prices hit an upward ceiling and once again crash to $65, it suggests that the bulls are fully tapped out for now. If that’s the case, it will take a major market change to get markets trending higher once again. The EIA’s data drove markets higher yesterday, with across-the-board drawdowns in oil stocks. Helping to accelerate the drawdown was extremely high demand. 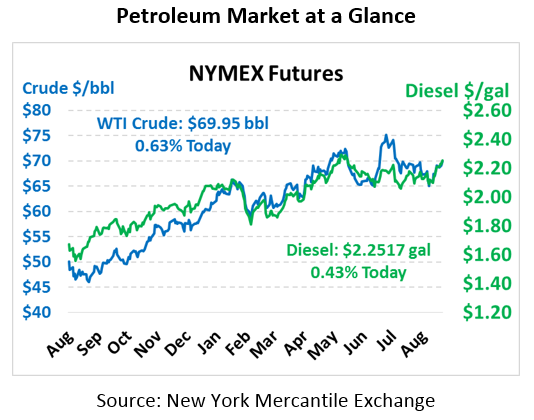 We noted earlier this week that markets were expecting one last demand rally – they got their wish as gasoline posted its largest weekly demand on record – 9.899 million barrels per day. Still, one week does not set a trend, and the 4-week moving average for gas demand is 1.5% below last year. Product draws were supported by a decrease in refinery utilization. Refineries have been running hot all summer, reaching historically high levels even during this busy time of year. This week, refinery utilization fell from 98.1% to 96.3%, a big drop. The exception was PADD 2 (Chicago/Midwest region) which saw utilization rise to 100% this week – as other refineries are slowing down, Chicago refineries are still enjoying large profit margins thanks to cheap Canadian crude supplies. As summer demand winds down from here and refineries begin their fall maintenance, expect national refinery utilization to continue falling. The result will be seasonally tighter markets over the next few months.